It is meritorious how the people of Sikkim came up with the marvellous idea to construct an enormous statue of Lord Buddha in a Park to celebrate his birth anniversary as well as add a feather in the cap of pilgrimage tourism. Located in the South Sikkim district in Ravangla, it stands at a distance of 1 km from the Ravangla Bus Stand. Another name for this fabulous park is 'Tathagata Tsal'. The statue was dedicated to Lord Buddha on the 25th of May 2013 by the 14th Dalai Lama and gained a place in the 'Himalayan Buddhist Circuit'. 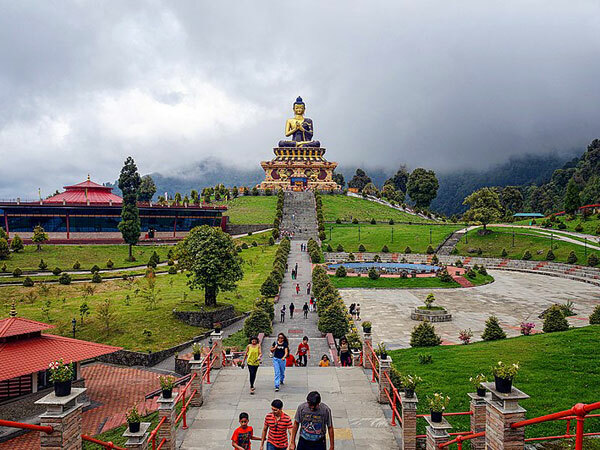 The people of Ravangla built this appealing Buddha Park which has the most gorgeous statue of Sakyamuni Buddha which can be seen crystal clear from all sides of Southwest Sikkim near Ravangla and from a few areas of West Sikkim. It is an alluring park for visitors to enjoy ample peace with spacious pathways for soothing strolls as well as picturesque surroundings. The added tinge of a Buddhist conclave and a museum meditation centre make the place all the more impressive. You have more hidden surprises enclosed in the park. The life of Gautam Buddha is depicted in two different manners within a gallery constructed in spirals. A lake called Cho-Dzo is guarded by forests on all sides. The Park has a divine touch to it as the site chosen for its establishment was Rabong Gompa Monastery, an age-old place for holy expeditions. The ideal time to set foot into this lovely park is from April to June but for the snow lovers, September to November is perfect to get an awesome view of the snow-covered Himalayan mountains as well as the colourful flowers doting the Park, which shall leave you speechless. It is around 80 km away from the capital town of Gangtok. It is connected to all places in Sikkim via taxi service. However, when standing in the main town area, you can simply walk to the Buddha Park. The entry fee per person is INR 50 and the timings are 9 am to 6 pm. This should be on the must-see list of tourist attractions in Ravangla. Only 9 km away from Ravangla, it has a magnificent view of the Sangalila range and the Chola range of Bhutan at an altitude of 6700 ft. The sunrise is breathtaking as it gently brightens the snow-covered peaks of various mountains, such as Mount Kabru, Mount Rathong, Mount Pandim and the remaining Himalayan range. Gather your friends and go for an engaging trekking trip to Deorali Dara and the rhododendron fields of Tinkitam as well as Gholey Bhir. This place situated at Borong near Ravangla, Sikkim is also a popular tourist attraction. The distance is 10 km from Ralang and 21 km from Ravangla. It is an exquisite hot spring in Sikkim located on the banks of the river Rangit. You will definitely want to visit this natural spa if we tell you that it has magical healing powers. In the local language, this spring is nick-named 'Borong Tsa-Chu'. It is every trekker's heaven as it has a lot of adveturous trails and wondrous hillsides to appreciate. People come here to take dips of bliss and attempt to rid themselves of any sickness. You can also pass time by spotting birds or trotting after multi-coloured butterflies can be exciting too! This place shall always light up your mood with its multitude of activities like the selling of dairy products, vegetables and other amenities during peak season by the local villagers while you stay in temporary huts but carry your own bedding and cooking utensils. December to February is when people prefer to visit this place. Who doesn't love amusement parks to splash around in the water and have some fun-filled moments? You shall instantly fall in love with this entertainment hub at Ravangla, situated at Legship in Sikkim. It was the local people of this area who undertook the building of the water world. It is a haven for the adventure buffs located right on the main river bed in the midst of cliffs. It simply requires to kindle the fire of enthusiasm within you to have an amazing time with your friends and family enjoying river rafting, angling or swimming. It shall definitely relax the soul and bring a smile on your face!